TV travel expert Simon Calder predicts that next year’s Royal wedding will bring a massive increase in the number of cruise ships visiting Anglesey. Mr Calder said the engagement of Prince William and Kate Middleton was “the kind of publicity money can’t buy”. The aim of the meeting, the last of three to be held in North Wales, was to highlight the challenges facing the industry in the coming years while offering ways in which operators, in conjunction with the various agencies, could help their businesses. And in a speech littered with humorous anecdotes as well as “do’s and don’ts”, Mr Caldwell included numerous suggestions for individuals, groups and agencies. One idea he floated was that of a “three-centre holiday” which could involve, for instance, Chester, Anglesey and Dublin linked by rail and sea. “That could be a very good pulling project if the price is right because Anglesey is only 75 minutes from Chester and then you could cross to Dublin,” he said. 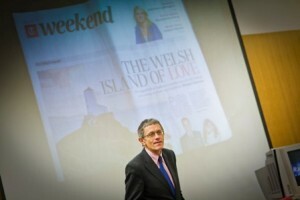 He also advocated “twinning” projects to help draw visitors, suggesting that Anglesey could comfortably be twinned with Singapore where there was a potentially huge market.“They are almost exactly the same size and it would be a good move because Singapore is going to be a very important market. You have a marvellous island product, a little corner of heaven,” he commented. Mr Morgan outlined all the recent and proposed developments taking place in marketing the island, one of the important new factors being the introduction of the mobile tourism information centre which will be taken around various venues and events. The unit will be located at Holyhead quay when the cruise ships arrive, giving visitors an immediate insight into what the entire island has to offer. He told the meeting that a “very encouraging” 136 entries had been received for this year’s Anglesey Tourism Awards, which will be presented on January 28.